We at Todich Floral Design love a challenge, an event where we can use all depths of our imagination to create wonderful unique floral designs. So when we had our client Hilton hotel contact us for flowers an end of year lunch event in their ballroom, we jumped at the chance. The theme was ‘casino’ and with the venue decorated to fit precisely this. Our sales consultants were ready to offer their ideas. We were asked to provide the flowers that can be incorporated in this theme and look funky, fun, and eye-catching. With the key colours black, white and red, our florists put together 9 simple floral posies, with a mix of red flowers and scented blue pine we included beautiful roses and striking gerberas into the arrangements. To be consistent with the theme of the event we then stylishly added poker dice, chips and weaved poker cards into the scented blue pine. 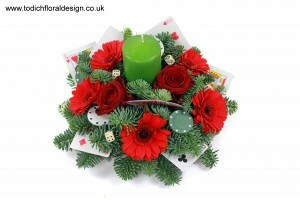 To make the arrangements vibrant and eye-catching we also included a lime green candle into the centre of the posies. Our florists had a lot of fun creating these designs, and they looked magnificent when finished with the poker paraphernalia. The flowers definitely made an impression and most certainly finished the look of the event, we fulfilled what was requested and both florist and clients were happy with the results. We think they suited perfectly… excuse the pun!